Situated on Falls Avenue Resort, Skyline Hotel & Waterpark is connected to attractions, shopping, and theme restaurants, through an indoor walkway. By hosting an event on Falls Avenue, meeting planners and co-coordinators have unparalleled access to first rate attractions, and theme restaurants for inclusion in planning and incentive based initiatives. The perfect spot for delegates to unwind after a meeting, to host a pre/post conference party or product launch is the Hard Rock Club Niagara Falls. The atmosphere is energizing as guests step out onto the huge Fallsview dance floor. Look above to see the world’s largest electronic disco ball, and dance the night away to the greatest songs of the moment. Enjoy a unique Tex-Mex menu with a Rock ‘n Roll flavor that’s irresistible. 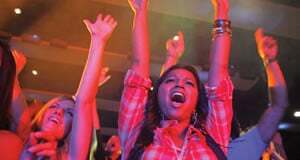 Event attendees will love Niagara’s very own tribute to the history of Rock creates a fun and entertaining dining experience. The 80-foot guitar bar is a great place to meet after spending the day in a conference or meeting. Check out the vast collection of authentic rock memorabilia, watch the latest rock videos and enjoy the unmatched environment and ambiance. The Hard Rock Café Niagara Falls is located on Falls Avenue, internally connected to the Sheraton on the Falls and Casino Niagara. Let your delegates take home a piece of the legend with genuine Hard Rock merchandise, speak to a member of our sales team for the latest items available for delegate gifts from from the Hard Rock Café Merchandise Shop. Watch out for the indoor Thunderstorm, shooting stars and “rainwall”. 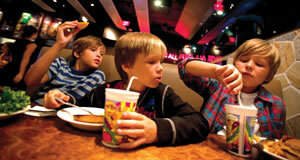 Located on the corner of Falls Avenue and the famous Clifton Hill, and internally connected to the Sheraton on the Falls, the Rainforest Cafe Niagara Falls is an adventure in casual dining. Delegates enter through the 80-foot volcano and experience the rainforest as it comes to life at this unique and entertaining themed restaurant and gift shop. The Mushroom bar is great for intimate meetings or large receptions. The Rainforest Cafe also offers unique Rainforest themed merchandise including an extensive line of private label Rainforest Café clothing. These Award Winning theme restaurants love to put on a show. Make your next event unique, for more information on hosting a special event, private party or large group function; contact the sales department at sales@niagarafallshotels.com or (905)374-4445. At 3 acres, the Fallsview Indoor Waterpark is one of the most unique venues you could find for a company function, or corporate get-together. 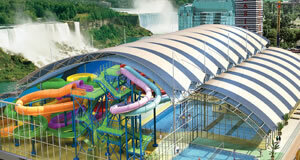 Attached to the Skyline Hotel & Waterpark via indoor walkway the waterpark is fun for all ages. Fallsview Indoor Waterpark is home to 16 thrilling slides up to six stories high, a giant wave pool, two oversized adult only Jacuzzis, the “Beach House” Mammoth Aqua Play Area, outdoor sun deck and activity pool, the Fully licensed Planet Hollywood Beach Club, and much more. The Fallsview Indoor Waterpark is an ideal location for team building exercises, to speak to a member of the sales team about hosting a team event at the Waterpark, contact us at sales@niagarafallshotels.com or (905)374-4445. 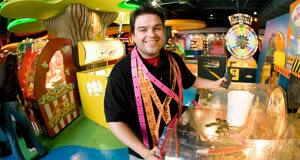 Adventure City plays host to the young at heart as co-workers come together to fight the forces of evil. Delegates focus on communication, co-operation, and networking skills at super hero challenges.